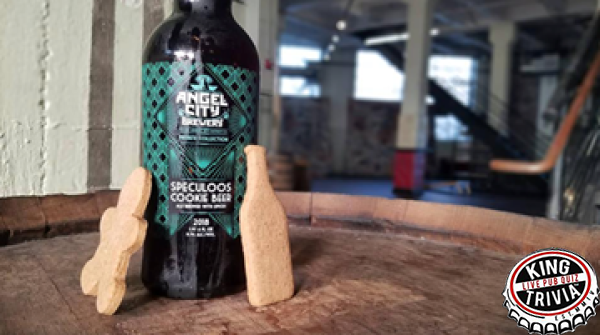 Angel City's quizsters found themselves out of the beer hall and in the main plaza this week, and the trivia challenging remained as tight as ever. We've practically got mere moments left before the tournament of champions... will YOU make it into that coveted Top 100? 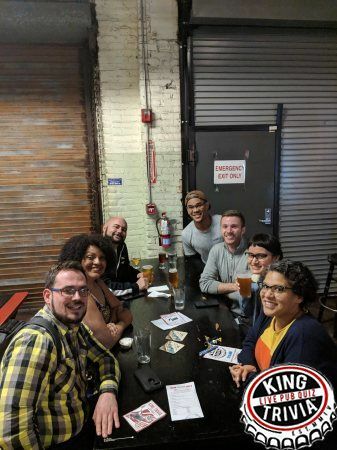 Congratulations to the Mad Trivia Addicts on their win, and an honorable mention to the Hipster Kippsters for jumping onto the podium with that final round double-down. Angel City proudly welcomed its biggest crowd ever tonight! The nights have gotten colder, and the good people of Los Angeles are huddling together, warmed by their shared knowledge of otherwise useless information. In our first round we learned the words Zonular and Groutier, and by the end of the game we had picked up info on the Panama Canal, City Populations, and Great Uncle Jack Kerouac. Congratulations to The Bad Explainers on a commanding win! Past the front gate and its sunsoaked mural... Past the cheery bouncers and their odd monochromatic wall art... Past the giant spooky booze drums... ACB's Beer Hall was packed to the gills! Tonight's game was the first match of December, and everyone and their mother turned out to compete. Congratulations to The Bad Explainers for their win, and of course for their unexpectedly good explanation of why they did indeed succeed their double-down in round 5. At this level of competition, you've got to fight for every point!